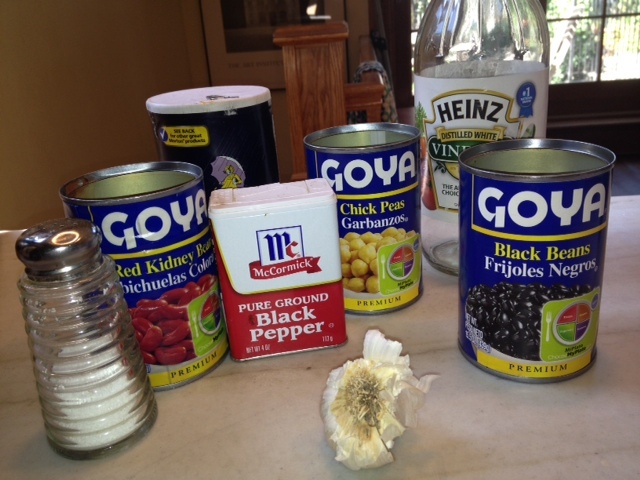 When I’m looking for an idea for an easy meal, I often turn to spice rubs. They are great for home cooks who don’t feel like chopping, dicing, slicing or any other serious knife activity. The only requirement is having a well-stocked supply of bottled herbs and spices, which I have. The other day, I didn’t feel like shopping but I was short on protein. I had two salmon filets in the freezer and three mouths to feed. But there was a bag of frozen shrimp. If I made the filets with a couple handfuls of shrimp, I would have enough protein to feed the three of us. I wanted to season the fish and shrimp the same way so I decided to try the spice rub used in Mark Bittman’s Four-Spice Salmon on my shrimp. Nothing ventured, nothing gained, right? This easy recipe, which mixes coriander and cloves with cumin and nutmeg, is a delicious way to season salmon. I had some leftover spice rub in a baggy in the fridge so I didn’t have to mix up a new batch. I sprinkled all the seasoning on the filets and shrimp and my husband, Tom, cooked it all in the same cast-iron skillet. 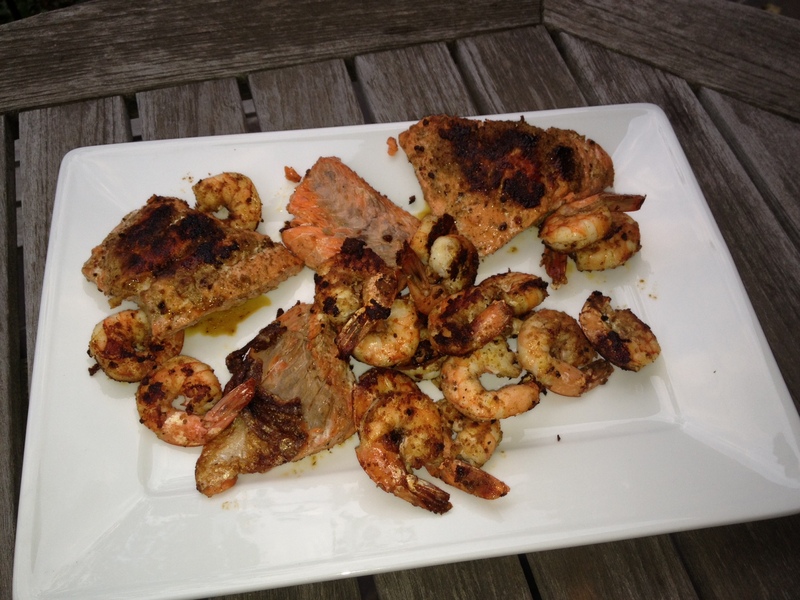 In well under 10 minutes, the salmon and shrimp were ready to eat. Quite tasty. It’s hard to get excited about three-bean salad. Just mentioning it makes you think of a side dish served at a diner or classic American picnic food. Boring, right? Before you stop reading, consider the health benefits of beans. On top of being nutritious, they are also cheap. There are ways to make three-bean salad interesting. Don’t worry. Even when you take this salad up a notch, it’s still quick and easy to make. In my version, there’s no cooking required. I used canned beans from my pantry. 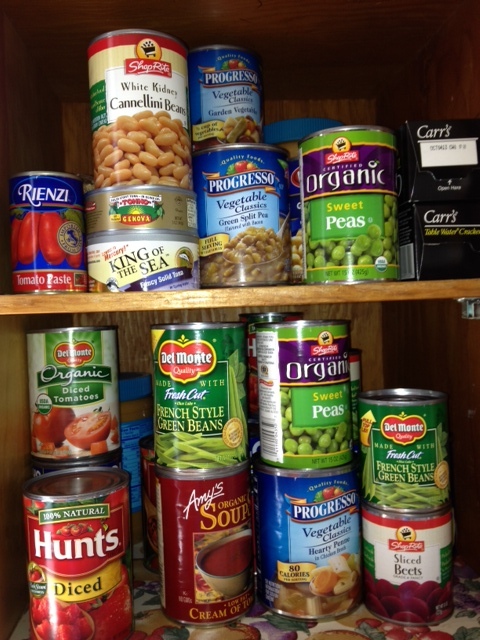 By the way, I try at all times to keep a variety of beans in the pantry to minimize last-minute trips to the store. I made this dish recently for lunch at a friend’s house. All five adults and my 13-year-old son, Jake, enjoyed it. Add the jalapeno, garlic, dill, olive oil and vinegar to a large bowl. Add the beans and mix everything up so the bean mixture is well seasoned. 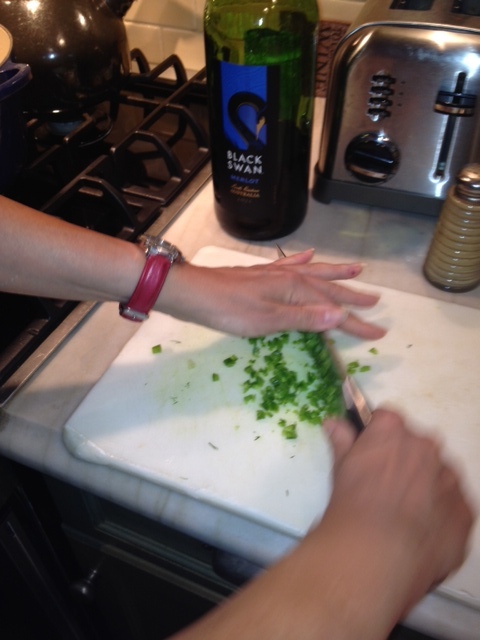 Add salt and pepper to taste and, if you like, more vinegar. This salad is best when it’s chilled. Leftovers can be stored in the refrigerator for several days. 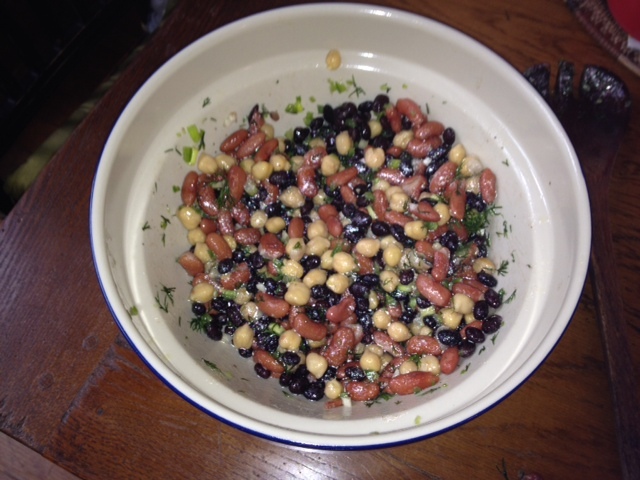 My three-bean salad. Not at all boring. Growing up, I ate plenty of cold deli sandwiches for lunch and, for better or worse, that habit has stayed with me. A sandwich consisting of two slices of bread, with deli meat and cheese, mayo and/or mustard tends to be what I have for lunch when I’m at home. 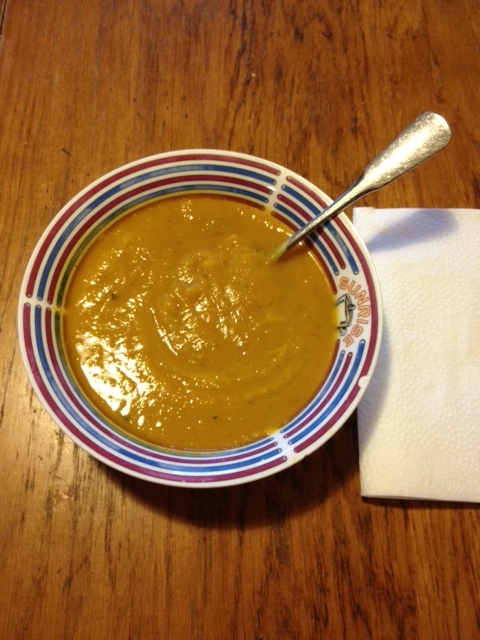 It’s hard to get excited about something you’ve eaten hundreds of times so yesterday I decided to break out of my rut. Naturally I had sandwich fixings in the fridge but instead of two slices of sliced sandwich bread, I grabbed a couple of tortillas. I took two slices of provolone cheese and cut them into strips, ripped a slice of ham into small pieces and dropped the ham and cheese on one tortilla. I covered it with the second tortilla and then poured a little vegetable oil in a skillet. When it was hot, I placed my creation in the pan. After a few minutes, I turned it over to make sure it browned on both sides and the cheese melted. I enjoyed a warm and hearty quesadilla with mustard and sour cream on the side. What a nice change of pace from cold cuts on sliced bread. It only took 15 minutes to make but you could shave a few minutes off the time since you won’t be taking photos. 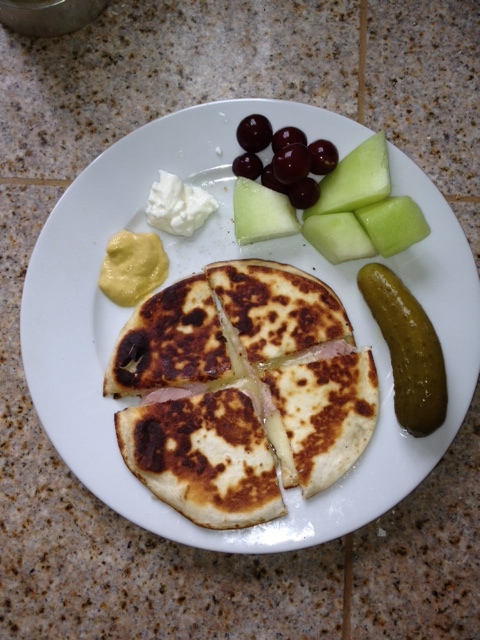 Ham & cheese quesadilla with mustard, sour cream, fruit and pickle. 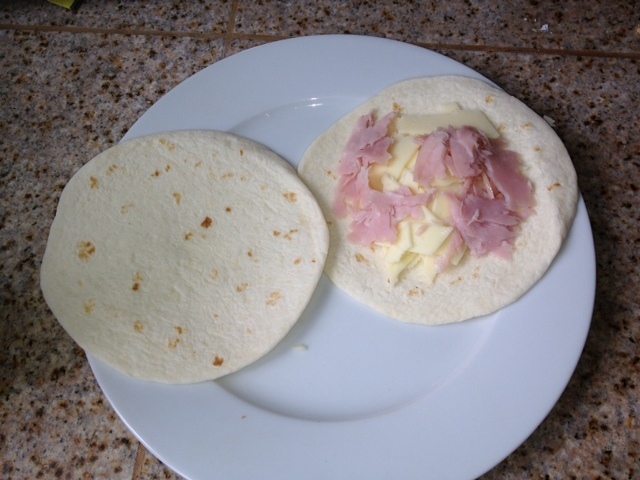 Place the cheese strips and ham pieces on one tortilla, then cover it with the second tortilla. Pour canola oil in a skillet. When it’s hot, carefully place your quesadilla in the pan, being careful to keep the filling between the tortillas. Quesadillas should be flat so I suggest pressing down on the tortillas with a large glass bowl. Carefully turn over the tortillas after 3 minutes or so to brown the other side. If your tortillas are not flat, press down with the glass bowl. Remove from the heat after two minutes or so, when the tortillas are golden brown and the cheese is melted. Slide onto a plate and cut into four wedges. Serve with mustard and sour cream on the side. If you like, add fruit and a pickle. My husband, Tom, is the best food recycler I know. Today he whipped up an omelet for us consisting of six eggs, red bell pepper and tomatoes left over from last night’s salad, a scrap of red pepper from the fridge and a little red wine, also from last night. He sautéed the peppers and tomatoes and cooked a few small red potatoes in the microwave. He chopped up the taters and added all the vegetables to the eggs, which were already cooking. For good measure, Tom tossed a few drops of Tabasco in the pan. 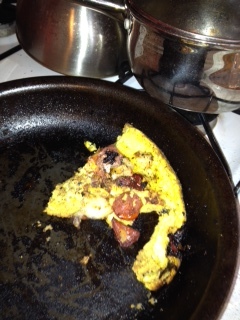 The result was a hearty and delicious omelet that I didn’t have to make. Even our son, Jake, who’s not much of an egg eater, enjoyed it. Tom’s always been enthusiastic about eating and lately, much to my delight, he’s taken more of an interest in cooking. He gets his “re-use, recycle” mentality from his French mother, Hélenè, a wonderful home cook who loves using leftovers and hates wasting food. Using leftovers to make meals takes some thought. Sometimes it’s just easier to pitch those leftovers and make a meal using all new ingredients. But cutting down on food waste is a worthy goal especially when you consider roughly 30 to 40 percent of the food supply in this country goes to waste. “In 2010, an estimated 133 billion pounds of food from U.S. retail food stores, restaurants, and homes never made it into people’s stomachs,” the U.S. Department of Agriculture recently noted. The amount of uneaten food in homes and restaurants was valued at almost $390 per U.S. consumer in 2008, which the government says is more than an average month’s worth of food spending. Those numbers are hard to swallow. They should make you think twice about tossing yesterday’s salad. In June, the U.S.D.A. and the U.S. Environmental Protection Agency, with support from the Food Waste Reduction Alliance, the anti-hunger group, Feeding America, the anti-poverty group, Rock and Wrap It Up!, and food manufacturers, introduced the U.S. Food Waste Challenge, a campaign aimed at reducing food waste through education and other activities. Are you doing anything in your own home to cut down on the amount of food you throw away? Everything I know about putting dinner on the table I learned by getting my hands, along with the stovetop, counters and kitchen table, dirty. I’ve been cooking ever since I got married 21 years ago. I credit my friends in the kitchen for teaching me how to make pretty good dinners. By the way, my “friends” don’t actually live in my kitchen but their books do. I’m talking about my favorite cookbook authors. One of them, Nathalie Dupree, popped up recently in the New York Times food section. Dupree was quoted in an article about reactions from Southern chefs to the latest Paula Deen controversy. 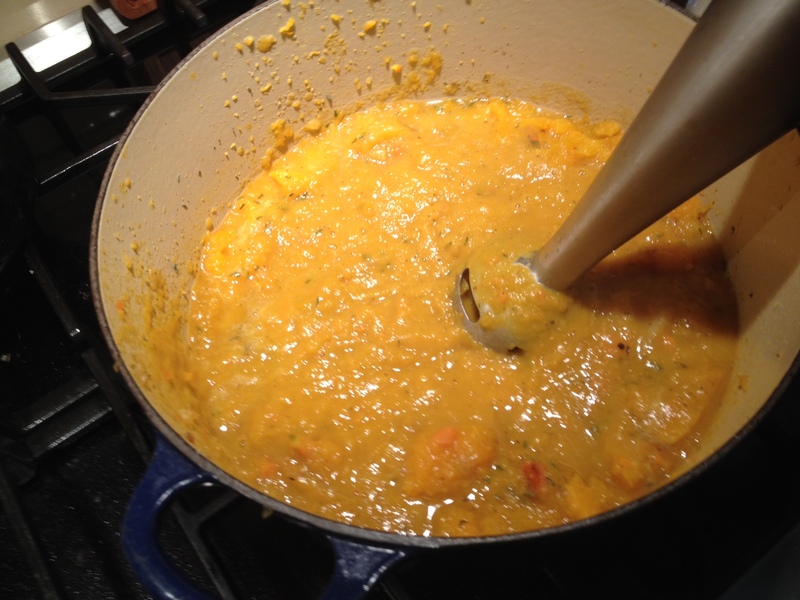 Though arguably not as famous as Deen, Dupree is a cooking celebrity in her own right. 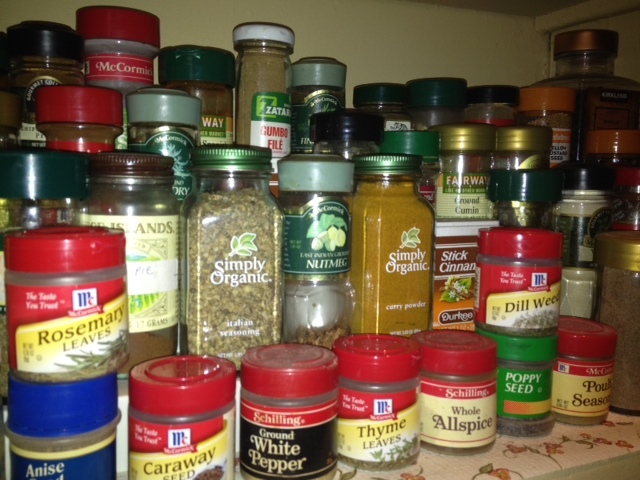 Among the many cookbooks she’s written, “Everyday Meals From a Well Stocked Pantry,” sits on a shelf in my kitchen. My copy of “Everyday Meals” has food stains on it, a bent cover and worn-out spine, which should tell you something about where the book ranks on my personal cookbook bestseller list. I like the book because it shows home cooks how to save time and money using ordinary ingredients. In these thrifty times, who doesn’t want to do that? Unlike those cookbooks that force you to spend an arm and leg on ingredients, “Everyday Meals” encourages home cooks to use what they (probably) already have in their pantries and freezers. One of my favorite recipes, “Middle Eastern Ratatouille with Grilled Chicken Breast,” uses bone-in, skin-on chicken breasts, which are much tastier than the more common boneless and skinless breasts. But it’s the ratatouille that makes this dish really special. Mixing traditional ratatouille vegetables with Middle Eastern spices, the recipe puts a tasty new spin on a traditional French vegetable dish. Make this for your family or even for company. You can impress your guests without blowing your budget. Truth be told, the ratatouille is not simple to make but once you make it, you can freeze a portion for a future dinner. Next to pantry raids, freezer meals are a home cook’s best friend. Thanks, Nathalie! You can find out more about her here.